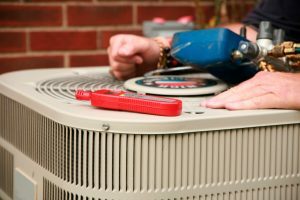 If you are interested in replacing your outdated air conditioning system with a new one, now is the ideal time to act. We’re enjoying mild weather at the moment, but that will likely change very soon, and when the heat comes, it will likely stay until October at the very soonest. Replacing an outdated system now means enjoying improved efficiency the minute summer begins, which can cut down on your monthly cooling bill a great deal. Once you’ve made the decision to replace your older air conditioner, the first thing you must determine is the new system’s power levels. This can be a trickier equation than you may think, but it’s vital to have a properly sized unit. If you don’t, it can end up costing you in a number of different ways. Most people assume that they should purchase the most powerful system they can afford. After all, don’t you want the air conditioner to cool the home as quickly as possible? In point of fact, you won’t. While the air conditioner needs a certain power level – an underpowered unit simply won’t cool the home – an overpowered unit will cause no end of troubles. Air conditioners use much more energy starting up and shutting down than they do just running. Ideally, you want yours to run at least 15 minutes at a time to make the most effective use of the energy consumed. If it’s overpowered, the system will engage in short-cycling: cooling the home rapidly and turning off, only to turn on again a short time later as our blazing summer heat warms the home up again. As you can imagine, the process of short cycling is very hard on your system. Not only will it cost you a great deal in wasted energy, but the added strain on the system means that you run a much higher risk of a breakdown earlier than you should. If not addressed, the issue could severely shorten the overall life of your new air conditioner. The best air conditioner for your home follows what we like to call the Goldilocks Rule: neither too small nor too large but just right. That involves a careful examination of your home and some technical calculations made in order to arrive at a final number. It starts with square footage – and your existing air conditioner’s six can provide a good baseline as well – but that’s not the only factor entailed. For example, homes with a lot of insulation in the walls will retain cool air more readily, and thus require a less powerful air conditioner than one without. Similarly, a home with wide picture windows – especially facing the west, where the sun can shine in during the hottest portion of the day – will require a larger system to off-set the added heat. For high-quality air conditioning sizing and replacement services in the Whittier, CA area and throughout Southern California, call the friendly pros at Greenleaf Heating & Cooling today!